The obtained hierarchically micro/nano-structured Ag-BS composite devices in "Y" shape channel based on silicon substrate. It realized catalytic reaction in a microfluidic chip and SERS-based monitoring. Microfluidic chips hold great potential for the application in the area of biological and chemical research, by integrating all the basic operations (chemical reaction, selection, separation, and detection) in a stamp size chip. It was evaluated to be the century technique by Nature. Till now the application of microfluidic chips has covered the fields of analytical chemistry, medical science, pharmaceutical, biology, environmental analysis, chemical engineering, material science etc. However there are many challenges to realize the catalytic reaction in a microfluidic system, e.g. it is hard to fix the catalysts position, the contact area between the catalysts and the reactants is relatively small, and the reaction efficiency is low. In order to solve these problems, it is crucial to improve the efficiency by integrating multifunctional elements in the non-planar microfluidic channel. Periodically conical microstructures were fabricated by femtosecond laser direct writing (FsLDW) in a "Y" shape channel based on silicon wafer substrate by a China-Japan joint research group. After hydrogenated by HF solution, Silver nanoparticles (AgNPs) could be in-situ grown on the BS surface and form Ag-BS micro/nano hierarchical structures. The Ag-BS hierarchical structure has large specific surface area and roughness, which helps improving the catalytic reaction efficiency (checked by pNP to pAP reaction). 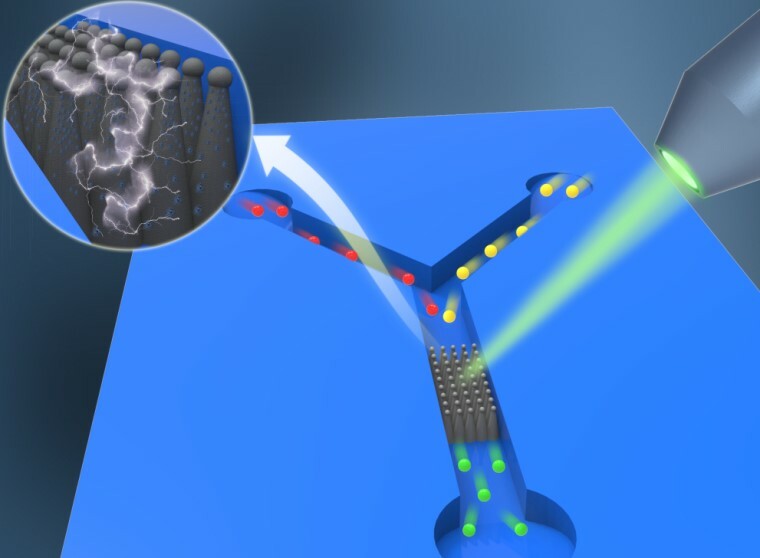 In the same time, this structure could also serve as a SERS substrate, for it would generate localized surface plasmon polaritons (LSPPs) to enhance the electromagnetic field. When used for SERS detection, the Ag-BS structure realized in-situ detection of the catalytic reaction. The sensitivity was tested to be as low as 10-8 mol/L using Rhodamine 6G. The results are reported in Chinese Optics Letters, Vol. 13, No. 10, 2015 (Z. X. Yan et al., Silver Hierarchical Structures Grown on Microstructured Silicon in Chip for Microfluidic Integrated Catalyst and SERS Detector). It was the first time to the best of the authors' knowledge that a chemical growth method was applied to grow silver nanoparticles (AgNPs) on BS on a microfluidic chip as catalytic reactor and SERS substrate. The obtained Ag-BS composite structures might create new opportunities for various applications in highly integrated chemical synthesis and analysis, and biomedical sensing and diagnosis. "The idea of integrating multifunctional Ag-BS micro/nano structures in microfluidic chip is very impressive. It provides a strong technical support for microfluidic technique toward practical application." says Dr. Jihong Zhao from Jilin University, who is a member of this joint group. The following works will be focused on fabrication of other metal-BS hierarchical structures, such as Au-BS, Pt-BS, and Pd-BS, and comparison of the relationship between the reaction efficiency and metal materials by in-situ SERS detection. The final goal is to achieve the optimized microfluidic system with high catalytic efficiency and good SERS performance.